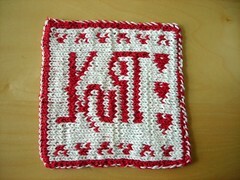 I was working on my first double knit pattern that I got for free from knittinghelp.com it was in red and white and had a heart design in it. Well, I accidentally messed up an edge and couldn't get it fixed right plus I really should have knitted with even a smaller needle; so I frogged it. 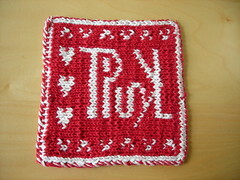 Now of course I want to learn how to do this, but wasn't terribly thrilled with the heart pattern and really which I'd only chose it because it was readily available and seemed simple enough for a first time project. So I got a little creative. It took me like all day to do this design plot it out and get it uploaded and what not, but hey here it is! Actually I started with a love/hate design which I'll also upload. Here's the Knit Vs. Purl Chart, but be warned that when I knit it up it wasn't square so I have to redo the chart. Stay tuned. I should have it done and uploaded on APR 29.